Let’s head to Brazil for a traditional dessert called pudim de leite condensado. The highest waterfalls in the world, the most beautiful bays in the world, the largest forest in the world, the most famous carnival, samba, soccer, capoeira, romantic beaches… Okay okay, Brazil seems to collect all the records! But what about Brazilian cuisine ? Let’s talk about it! 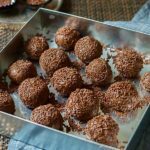 Brazilian cuisine offers a multitude of culinary specialties that go well beyond galinhada and caipirinha. 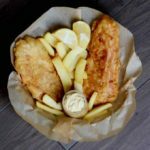 There isn’t just one Brazilian cuisine but several Brazilian cuisines! Indeed, remember that Brazil is a very large country (about the size of the United States) with numerous influences. 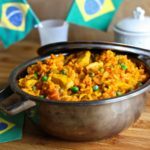 Yes, with over 500 years of history, Brazilian cuisine was born from a great mix of traditions introduced not only by the indigenous population but also by all the migratory waves: Portuguese, Italian, Indian, and Argentinian. Each Brazilian region has its specificity and has developed its own dishes but if there is one recipe that you will find throughout the country, it is the one that I chose to prepare today: pudim de leite condensado which is pronounced “pudjim djee leitche condensado”. Pudim de leite condensado as it is known today, is a dessert made of milk, eggs and sugar. Its name directly comes from the English word pudding. 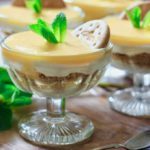 In Brazil and Portugal, the word pudim defines a creamy preparation, whether sweet or savory, baked in a water bath, sometimes with wheat or other cereal flour, but also milk or cream, egg, bread, orange, cheese, sardines, cod, tuna, chicken or veal. Despite the huge popularity of this pudim in Brazil, it is hard to believe that this dessert is actually a specialty that is originally from Portugal. 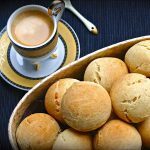 What is the origin of Brazilian pudim? The story goes that this dessert was invented by a Portuguese priest, Manuel Joaquim Machado, better known by the name of Father Priscos. He was an accomplished amateur chef in the nineteenth century. He used to prepare many excellent recipes for banquets of the royal court of Portugal. But Father Priscos never revealed his recipe to anyone. The success of his pudim was so great that he decided to host a competition with other cooks. No one managed to replicate it even if a few got close to it. His recipe was only revealed after his death but his cookbook mysteriously disappeared. 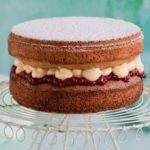 The secret of his recipe was still divulged: sugar, egg yolks, water and… the ingredient that made all the difference: lard! 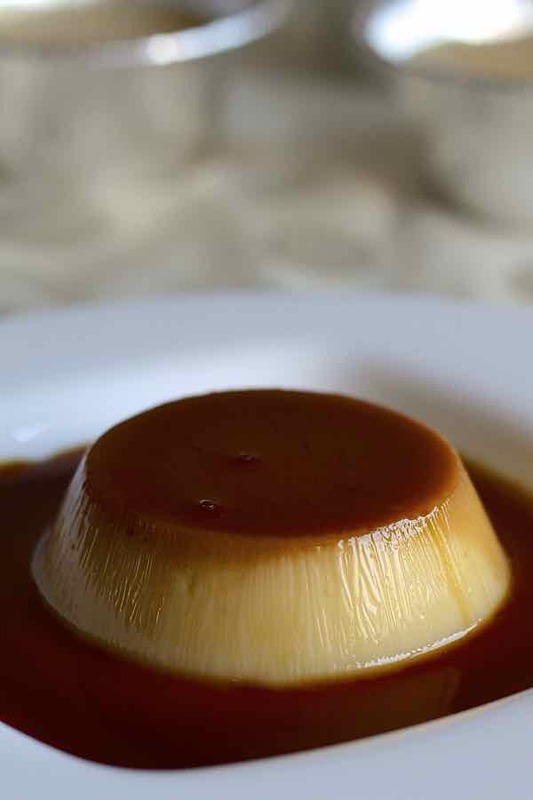 It is safe to say that one of these versions of the pudding arrived in Brazil during the colonial period. Goodbye lard! 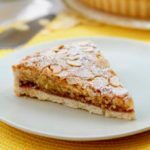 It was then prepared with whole milk, eggs, sugar and almond flour. 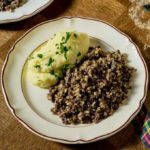 The preparation involved complicated steps since the milk had to be boiled and simmered for many hours. Quite hard work as you had to constantly stir. Then, it was necessary to incorporate the eggs, lots of eggs, and other ingredients and then you still had to simmer for a long time, while stirring, stirring, stirring tirelessly until the mixture thickened. Then, you had to make the caramel and cook the whole thing in a water bath. Quite an adventure! 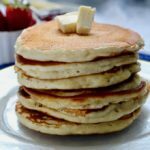 Often, people missed the recipe as the mixture of flour and milk could thicken too much. 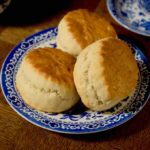 Then, in the early nineteenth century, came an ingredient that would change everything! Indeed, cans of condensed milk imported from Switzerland arrived in Brazil, and helped the history of pudim de leite condensado. It was not necessary to simmer whole milk for many hours anymore with the added risk of severe tendinitis! 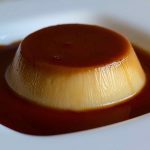 This pudim recipe is really a creme caramel and therefore a flan (custard) as creme caramel is a variant of standard flan topped with cooked sugar. 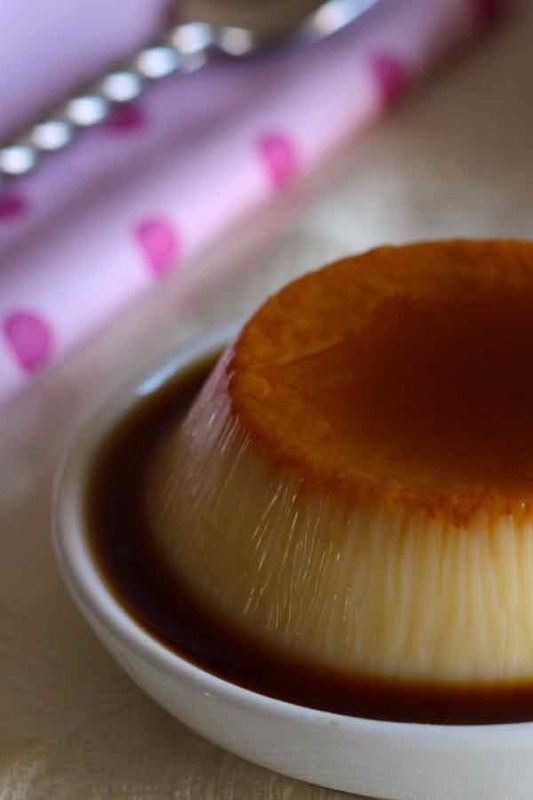 You can find several versions of the pudim de leite condensado throughout Latin America . In Uruguay, Argentina and Mexico, it is the same preparation but is rather topped with milk jam. In Chile, it is often accompanied by quince paste. 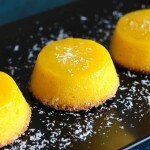 9 of 10 Brazilians consider pudim de leite condensado their favorite dessert and they are right! 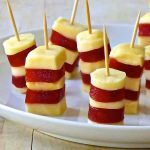 It is a simple and delicious dessert. We absolutely loved it! Pudim de leite condensado is a popular Brazilian and Portuguese custard recipe, prepared with condensed milk, sugar and eggs. In a non-stick saucepan, melt the sugar over low heat. After about 10 minutes, the sugar should turn into a golden caramel. 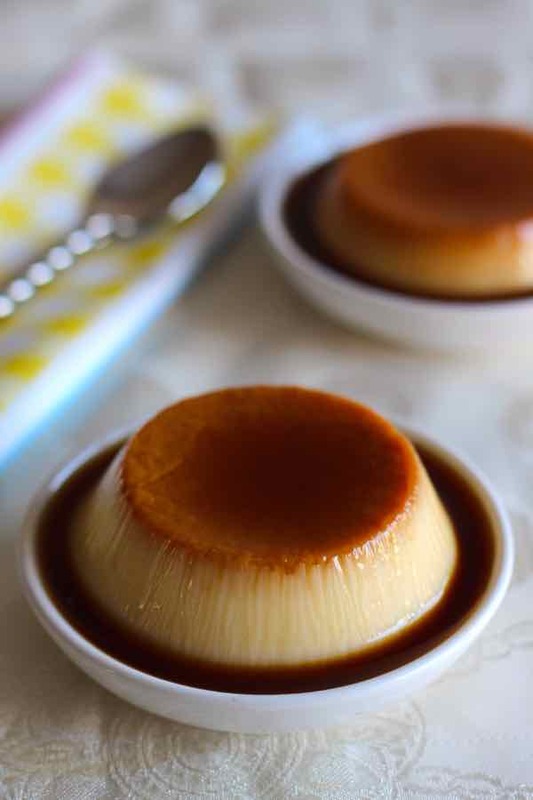 Immediately pour the caramel into a round mold, or in several small ramekins by tilting the dish or the ramekins so that the caramel uniformly covers all sides. Let cool. Separate the eggs. Put the egg yolks in a blender and mix at medium speed for 5 minutes. Add sweetened condensed milk, milk, and egg whites. Blend again until the mixture is homogeneous. Pour the mixture into the mold or the ramekins and cover with parchment paper. Place mold or ramekins in a water bath of boiling water and bake. Constantly check the level of the water bath and add boiling water during baking if necessary. Bake for 45 to 50 minutes, until a skewer inserted an inch from the edges of the pudim comes out clean. Let cool completely before unmolding. Then, refrigerate for 4 hours before serving. The pronounce “pudjim djee leitche condensado” depends the region. As Brazil have many accents, the pronounce is different among the country.